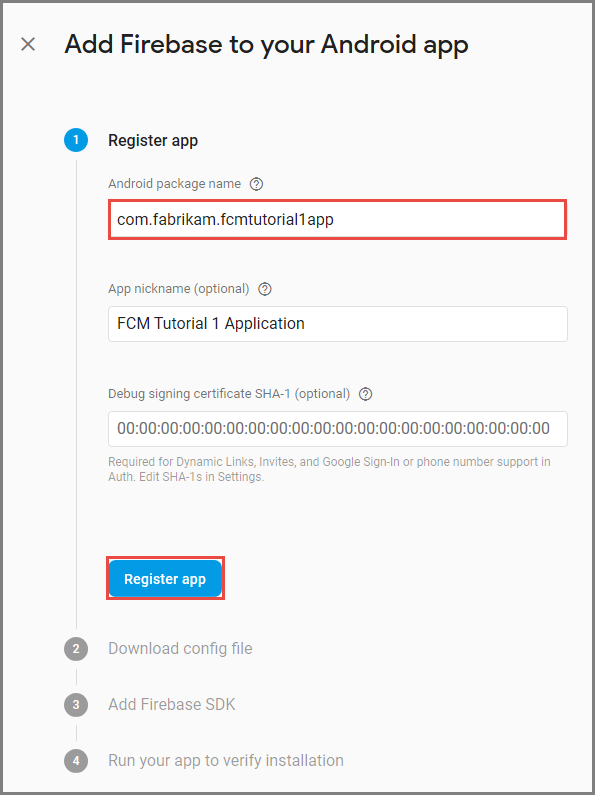 This tutorial shows you how to use Azure Notification Hubs and Firebase Cloud Messaging (FCM) to push notifications to an Android application. 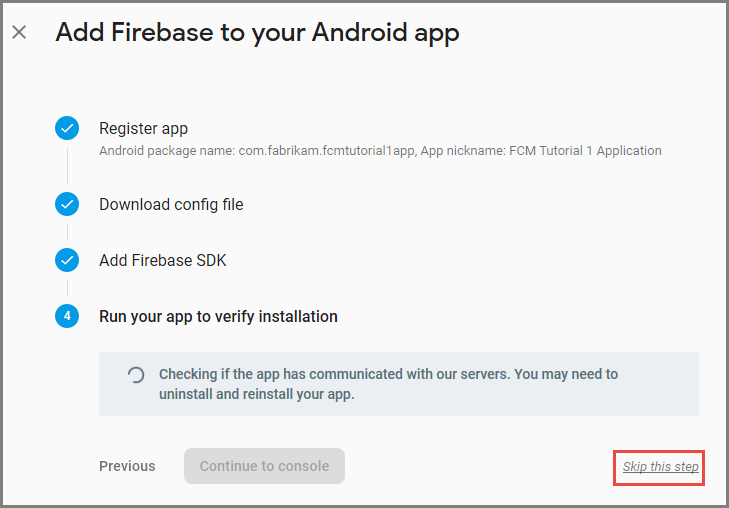 In this tutorial, you create a blank Android app that receives push notifications by using Firebase Cloud Messaging (FCM). The completed code for this tutorial can be downloaded from GitHub here. 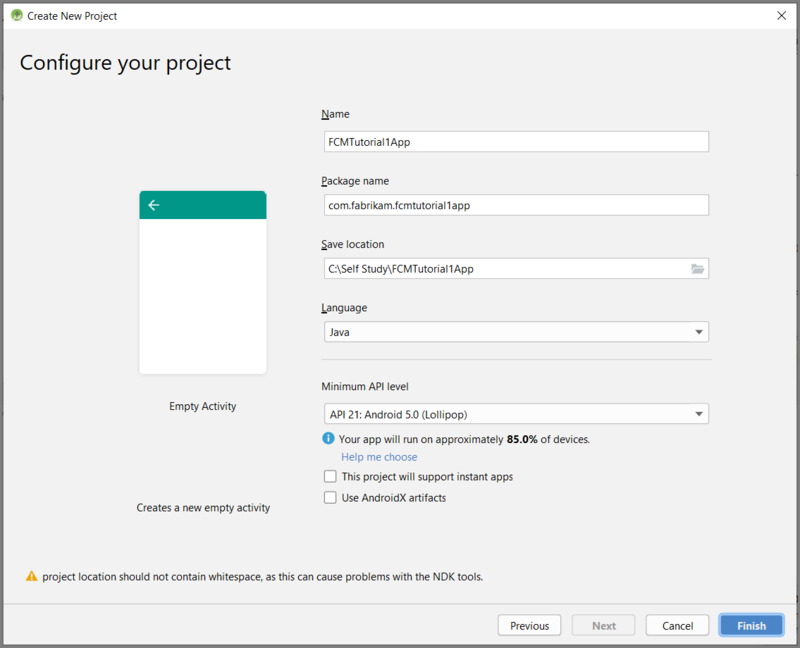 Create an Android Studio project. 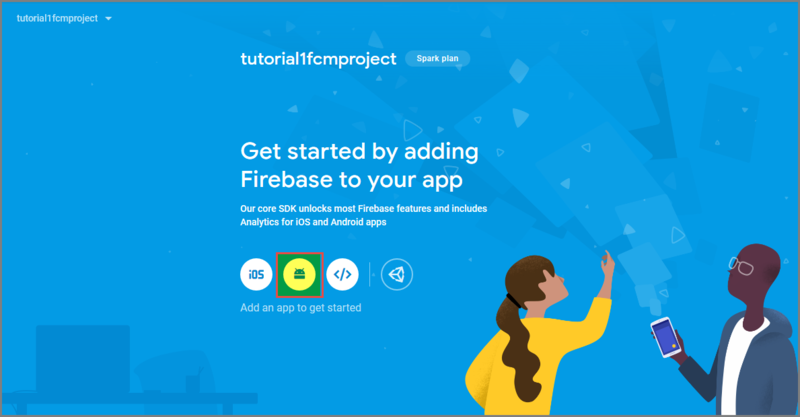 Create a Firebase project that supports Firebase Cloud Messaging. Connect your app to the notification hub. To complete this tutorial, you must have an active Azure account. If you don't have an account, you can create a free trial account in just a couple of minutes. For details, see Azure Free Trial. 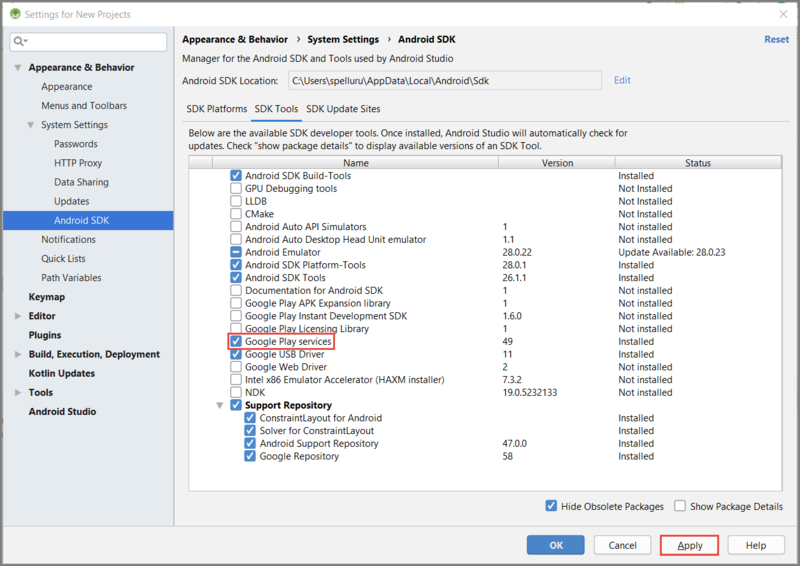 In addition to an active Azure account mentioned above, this tutorial requires the latest version of Android Studio. Android 2.3 or higher for Firebase Cloud Messaging. Google Repository revision 27 or higher is required for Firebase Cloud Messaging. 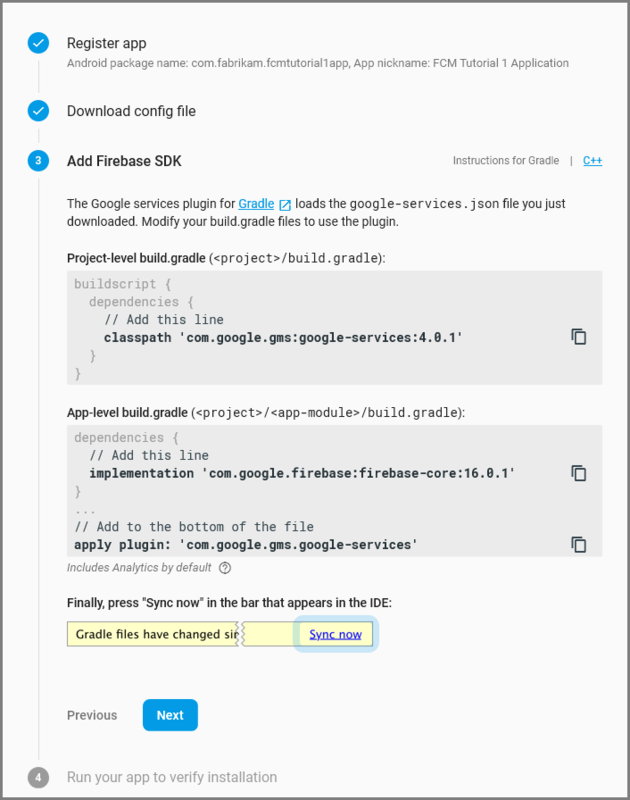 Google Play Services 9.0.2 or higher for Firebase Cloud Messaging. 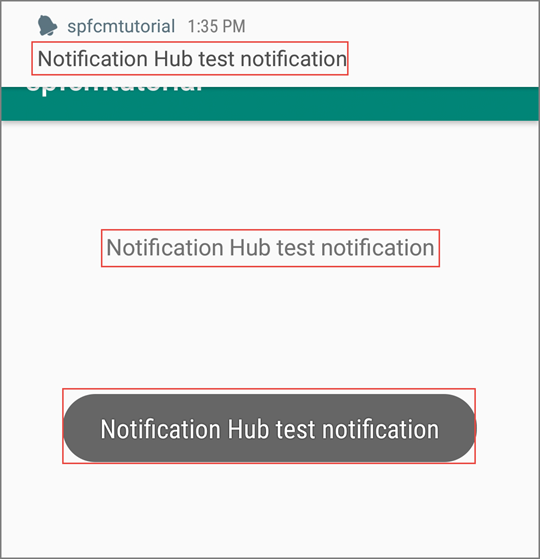 Completing this tutorial is a prerequisite for all other Notification Hubs tutorials for Android apps. Select File on the menu, point to New, and select New Project. On the Choose your project page, select Empty Activity, and select Next. Select All services on the left menu, and select Notification Hubs in the Mobile section. Select star (*) next to the service name to add it to the FAVORITES section on the left menu. After Notification Hubs is added to FAVORITES, select it on the left menu. On the Notification Hubs page, select Add on the toolbar. Specify a name for the notification hub. Specify a name for the namespace. A namespace contains one or more hubs. Select a location in which you want to create the notification hub. Select an existing resource group or enter a name for the new resource group. Select Notifications (Bell icon), and select Go to resource. You can also refresh the list in the Notification Hubs page, and select your notification hub. Select Access Policies from the list. Note the two connection strings that are available to you. You need them to handle push notifications later. Do NOT use the DefaultFullSharedAccessSignature in your application. This is meant to be used in your back-end only. Select Google (GCM/FCM) under Settings on the left menu. Paste the server key for the FCM project that you saved earlier. Select Save on the toolbar. You see a message in alerts that the notification hubs has been successfully updated. The Save button is disabled. Your notification hub is now configured to work with Firebase Cloud Messaging, and you have the connection strings to both register your app to receive and send push notifications. 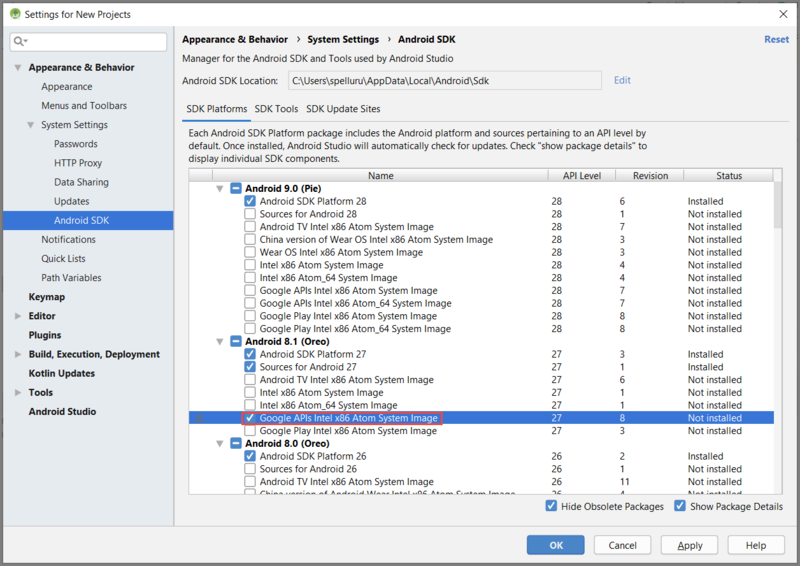 In Android Studio, select Tools on the menu, and select SDK Manager. 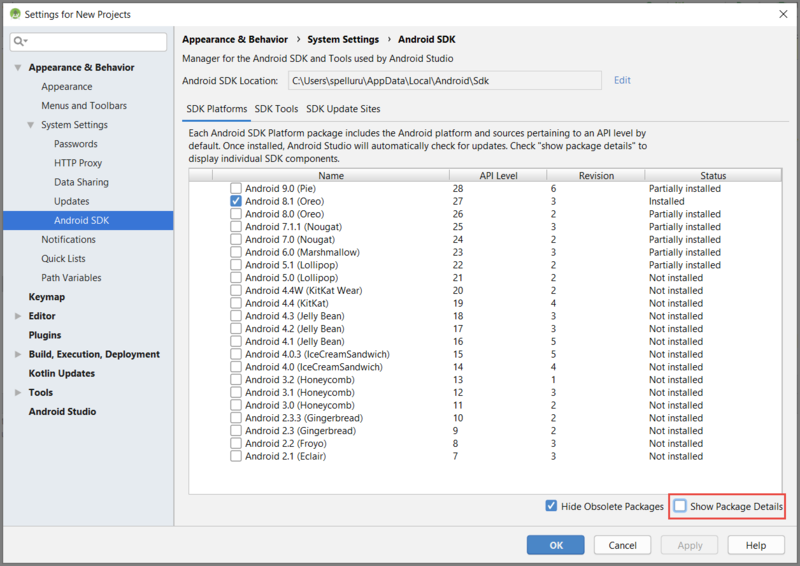 Select the target version of the Android SDK that is used in your project, and select Show Package Details. Select Google APIs, if it is not already installed. Switch to the SDK Tools tab. If you haven't already installed Google Play Service, select Google Play Services as shown in the following image. Then click Apply to install. Note the SDK path, for use in a later step. If you see the Confirm Change dialog box, select OK. The Component Installer installs the requested components. Select Finish after the components are installed. Select OK to close the Settings for New Projects dialog box. Open the build.gradle file in the app directory, and add this line under dependencies. Select Sync Now icon in the tool bar. Open AndroidManifest.xml and add this tag to the application tag. In the Build.Gradle file for the app, add the following lines in the dependencies section. Add the following repository after the dependencies section. In the Build.Gradle file for the app, add the following lines in the dependencies section if it doesn't already exist. Add the following plugin at the end of the file if it doesn't already exist. To support FCM, you must implement an Instance ID listener service in your code, which is used to obtain registration tokens using Google's FirebaseInstanceId API. In this tutorial, the name of the class is MyInstanceIDService. Add the following service definition to the AndroidManifest.xml file, inside the <application> tag. Once you have received your FCM registration token from the FirebaseInstanceId API, you use it to register with the Azure Notification Hub. You support this registration in the background using an IntentService named RegistrationIntentService. This service is also responsible for refreshing your FCM registration token. You need to also define a receiver to receive notifications. Add the following receiver definition to the AndroidManifest.xml file, inside the <application> tag. Replace the <your package NAME> placeholder with your actual package name shown at the top of the AndroidManifest.xml file. Select Sync Now on the toolbar. Add the following necessary FCM-related permissions below the </application> tag. In the Project View, expand app > src > main > java. Right-click your package folder under java, click New, and then click Java Class. Enter NotificationSettings for the name, and select OK.
HubListenConnectionString: The DefaultListenAccessSignature connection string for your hub. 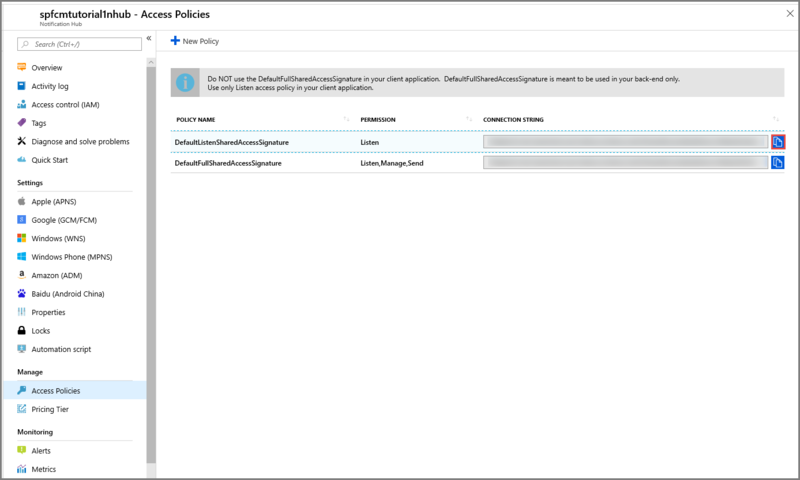 You can copy that connection string by clicking Access Policies in your hub on the Azure portal. HubName: Use the name of your notification hub that appears in the hub page in the Azure portal. Enter the name and the DefaultListenSharedAccessSignature of your notification hub before proceding further. Add another class named MyInstanceIDService. This class is your Instance ID listener service implementation. The code for this class calls your IntentService to refresh the FCM token in the background. Add another new class to your project named, RegistrationIntentService. This class implements the IntentService interface, and handles refreshing the FCM token and registering with the notification hub. Use the following code for this class. // Check if the token may have been compromised and needs refreshing. // Notify UI that registration has completed. In your MainActivity class, add the following import statements above the class declaration. Add the following members at the top of the class. You use these fields to check the availability of Google Play Services as recommended by Google. In your MainActivity class, add the following method to check the availability of Google Play Services. 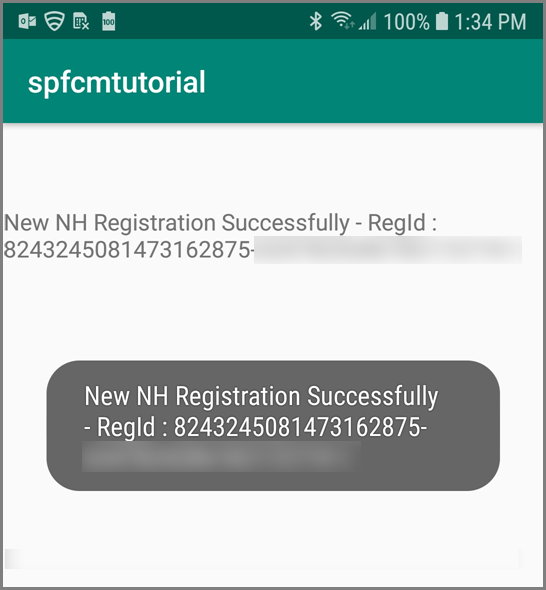 In your MainActivity class, add the following code that checks for Google Play Services before calling your IntentService to get your FCM registration token and register with your notification hub. // Start IntentService to register this application with FCM. In the OnCreate method of the MainActivity class, add the following code to start the registration process when activity is created. To verify app state and report status in your app, add these additional methods to the MainActivity. The ToastNotify method uses the "Hello World" TextView control to report status and notifications persistently in the app. In your res -> layout -> activity_main.xml layout, add the following ID for that control. Next you add a subclass for your receiver you defined in the AndroidManifest.xml. Add another new class to your project named MyHandler. Add the following code for the MyHandler class making it a subclass of com.microsoft.windowsazure.notifications.NotificationsHandler. This code overrides the OnReceive method, so the handler reports notifications that are received. The handler also sends the push notification to the Android notification manager by using the sendNotification() method. The sendNotification() method should be executed when the app is not running and a notification is received. In Android Studio on the menu bar, click Build > Rebuild Project to make sure that no errors are present in your code. If you receive an error about the ic_launcher icon, remove the following statement from the AndroidManifest.xml file. Run the app on your device and verify it registers successfully with the notification hub. Registration may fail on the initial launch until the onTokenRefresh() method of instance ID service is called. The refresh should initiate a successful registration with the notification hub. In the Azure portal, on the Notification Hub page for your notification hub, select Test Send in the Troubleshooting section. Select Send. You do not see a notification on the Android device yet because you haven't run the mobile app on it. After you run the mobile app, select Send button again to see the notification message. See the result of the operation in the list at the bottom. You see the notification message on your device. Push notifications are normally sent in a back-end service like Mobile Apps or ASP.NET using a compatible library. If a library is not available for your back-end you can also use the REST API directly to send notification messages. 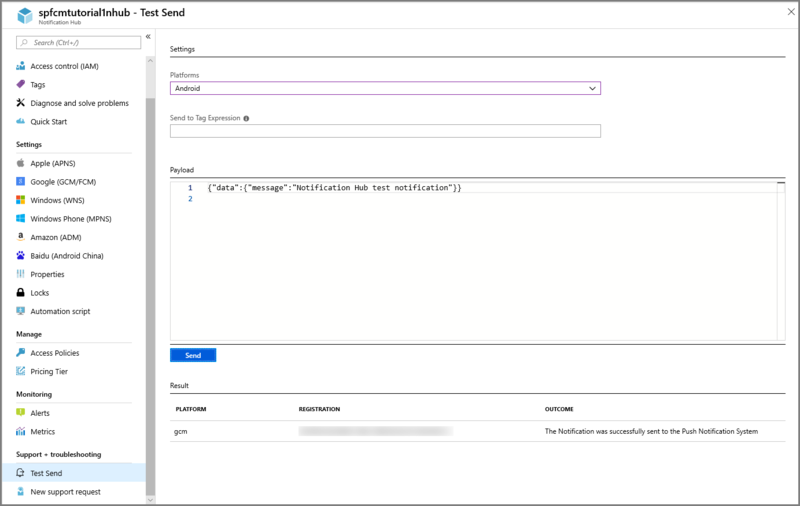 Azure Mobile Apps: For an example of how to send notifications from a Mobile Apps back-end integrated with Notification Hubs, see Add Push Notifications to your iOS App. ASP.NET: Use Notification Hubs to push notifications to users. 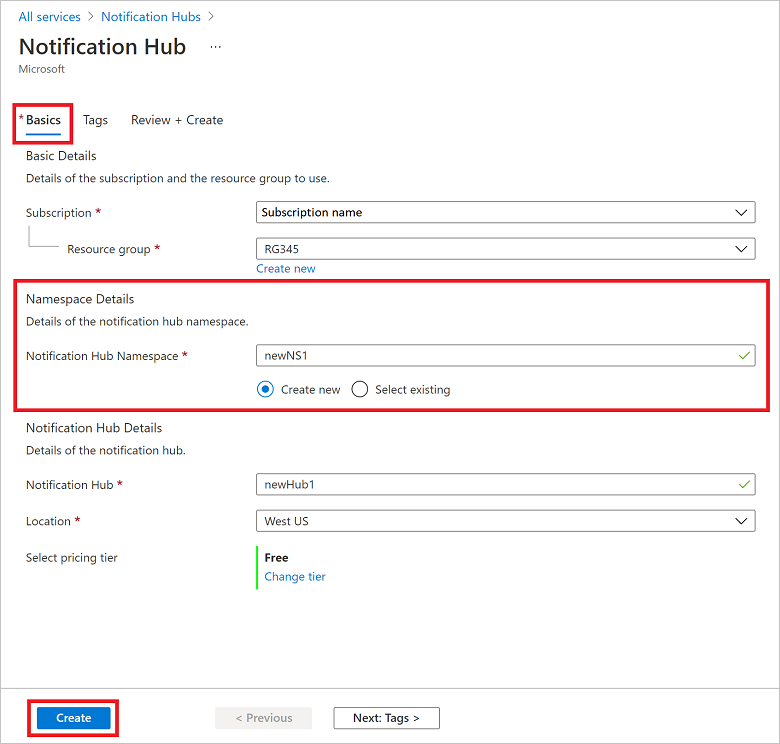 Azure Notification Hub Java SDK: See How to use Notification Hubs from Java for sending notifications from Java. This has been tested in Eclipse for Android Development. PHP: How to use Notification Hubs from PHP. If you want to test push notifications inside an emulator, make sure that your emulator image supports the Google API level that you chose for your app. If your image doesn't support native Google APIs, you may get the SERVICE_NOT_AVAILABLE exception. In addition, ensure that you have added your Google account to your running emulator under Settings > Accounts. Otherwise, your attempts to register with GCM may result in the AUTHENTICATION_FAILED exception.